A majority of fossils distributed by Other Worlds are highly recommended for students and collectors of all ages. A major factor in choosing which specimens we acquire for distribution are the intricate details each possesses to permit logical interpretations of the creatures' lifestyles while alive and thriving. It has been our observation that most inexpensive kits which include large numbers of specimens are limited to identification only. * Stromatolites are the oldest known fossils. Their waste product – oxygen – made way for the first oxygen-breathing organisms on Earth. * The name “nummulite” was derived from the Latin word “nummulus” meaning “little coin,” a reference to their lenticular shape. * Graptolites are an extinct group of marine animals that lived in the seas from the Cambrian period to the Carboniferous period. Some were attached to the sea floor by roots, while others floated freely, or attached themselves to seaweed. Presence of bones indicate a carniverous predator. ~ 2" x 1.5" matrix. ​Graptolites are the white patterns. Polished specimen. ~ 2.34" x 2.0"
Patterns render these easily identifiable. ~ 1.5" to 1.75" in diameter. Very distinctive patterns on large matrix. 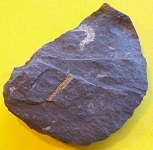 Graptolites are the light-colored features. Two specimens included - one from Egypt; the second from Armenia.